Over the past year the idea of what makes a good tutorial has fascinated me. Tutorials can be summarized into Explicit tutorials and Implicit tutorials. The general distinction between the two methods comes from the way in which the game delivers information to the player. Explicit tutorials pause play or control forward progress by using instructional text and audio, as well as overt HUD elements whereas implicit tutorials teach new mechanics without instructional text, audio, or overt HUD elements. The game teaches the player how to play using explicit tutorials while players teach themselves how the game works through the aid of implicit tutorials. The importance of the tutorial divide in the industry comes down to how players interact with a game from the very beginning. No game wants to risk a poor introduction since that might lose player interest before the player encounters the gameplay highlights. However, the player must learn how to play before they can progress and the balance between those two desires can cause games to succeed or fail. Many studios prefer a tutorial based on explicit communication that walks the player through every action required to play, even at the risk of boring the player at the very beginning of the game. However, there has been a consistent push to refine tutorials to use more implicit communication that teaches players while still affording them an open gameplay experience. The movement rests on the notion that both the desire to start with strong gameplay and the need to teach the player can complement each other without explicit step-by-step instruction. The overall test evaluates three levels that teach identical mechanics but differ in terms of the specific tutorials. Each tester plays only one version of the level, whether that is the explicit, implicit, or control version of the level. The thesis proctor randomly chooses which specific version a tester plays before the test begins. Each subject plays through one level with the goal of finishing the level by assassinating the local commander. The level structure ensures that the player must learn how to use every mechanic in order to finish the level. 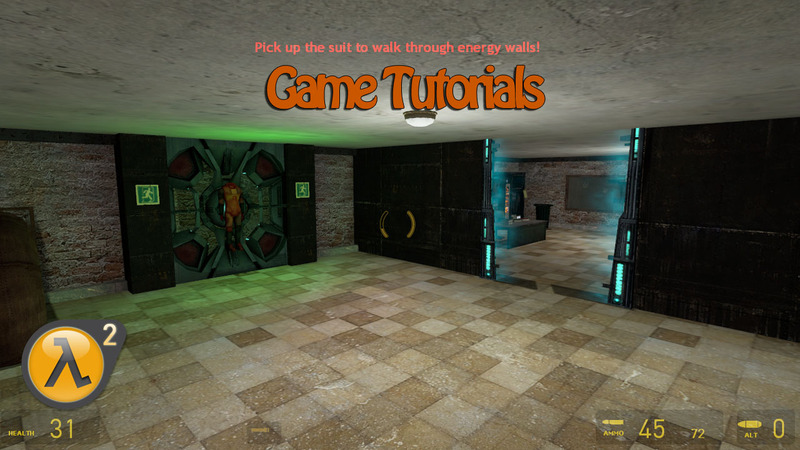 Each level uses Half Life 2: Episode 2 (Valve, 2007) as the engine base and the Source Software Development Kit as the level editor. A web survey and the test moderator’s own recorded evaluation of the test represent the basis for evaluating each player’s comprehension and enjoyment. The results point to Explicit and Implicit tutorials affecting the gameplay in unique ways. 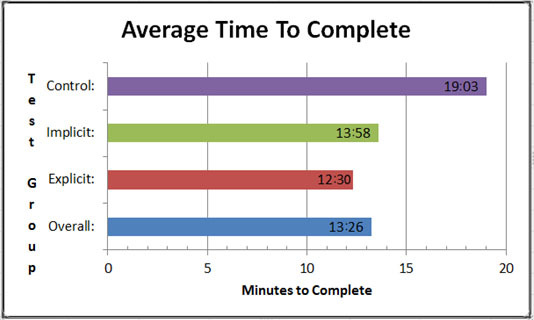 Both player enjoyment and gameplay speed are relatively even between Explicit or Implicit tutorials. However, Implicit tutorials encourage player creativity in ways that Explicit tutorials seem to limit. Implicit testers consistently discovered hidden paths and unique solutions to problems while Explicit testers seem interested in only finishing as quickly as possible. Greater detail available under the Results tab! HUD Popups: Helpful information appears on the HUD that acts as a reference guide for the player. The pop-up does not pause gameplay but remains until the player either uses the information or the pop-up disappears after a timer expires. Lock-stepping: The player encounters interrupt messaging that introduces the new mechanic and then allows them to perform the first step of the mechanic. The tutorial then presents a congratulatory message on successful completion coupled with instructional text for the next step of the mechanic. 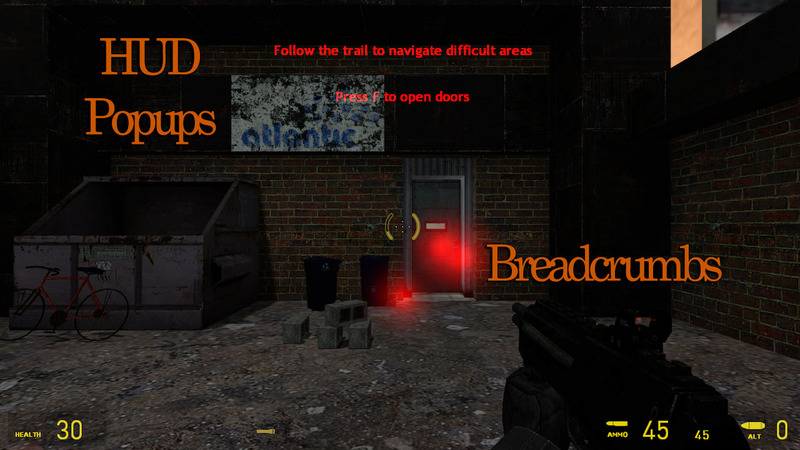 Breadcrumbs: Highlighting the critical path leads the player in the correct direction while allowing them to move about under their own power. The player possesses the freedom to explore, but are clearly guided in a particular direction. Using this technique to show pickups or critical parts of level layout ensures that the player knows how to play the game as intended. Non-Interactive Video: Walks the player through an action without giving them control during the sequence. The player observes the game perform the actions at the right time within the context of the situation. While the game becomes a passive experience, the goal remains that the player knows how to play once the video completes. Down-Time: The player encounters a gameplay environment that does not hurry or threaten them, which encourages experimentation and exploration. Necessity of Action: Each level section requires the player to successfully learn and apply a new mechanic. Checkpointing: Player progress remains preserved throughout the entire level which reduces the risk of death. This encourages the player to experiment and explore. Death becomes a learning tool instead of a prohibitive concern. NPC Foreshadowing: The NPC tutorial fits into gameplay to preserve the player’s immersion. An NPC shows the player how to perform a complex action and the player then attempts the action themselves. NPC foreshadowing occurs within gameplay, and does not take control away from the player or break immersion. Adaptive Messaging: Visual help that only displays if the player continues to struggle with a mechanic. Players who successfully complete the mechanic never encounter the message while players who are struggling see the help tip and avoid further frustration. Positive Reinforcement: Aural or visual congratulatory messages let the player know the precise moment they do something correctly. This reinforces the action and encourages the player to perform the action again in a similar situation. I created a Masters Thesis around determining whether players prefer Explicit, Implicit, or the absence of tutorials. 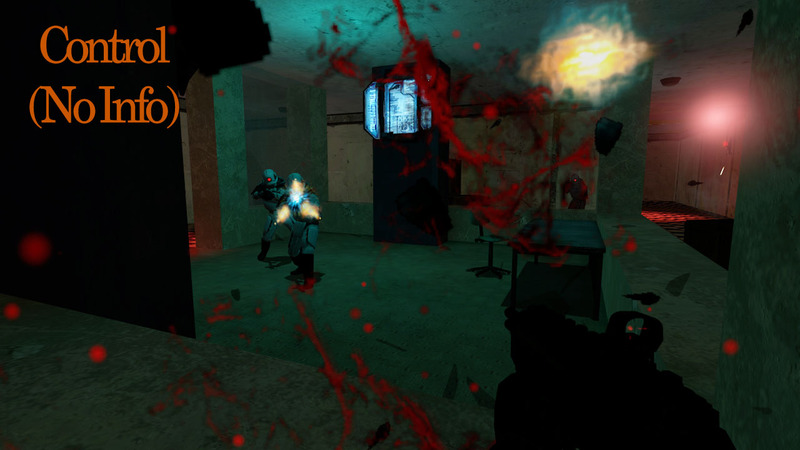 The project focuses on three versions of a level based in the Half-Life 2 engine (Source SDK). 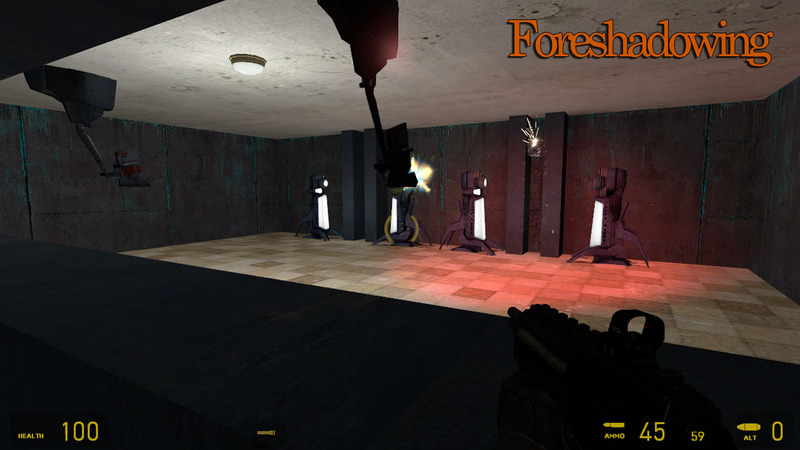 The levels remain identical in terms of gameplay while the tutorials that teach the new mechanics are different in both function and appearance. In order to use best practices from previous games the research builds on a wide variety of games that use explicit or implicit tutorials, including Persona 4 Arena, League of Legends, FIFA Soccer 11, Journey, Limbo, Portal 2, and Half-Life 2. Testers play one of the three level versions (Explicit, Implicit, or Control) and fill out both pre-test and post-test surveys about their level of familiarity with gaming and their reaction to the level. The level teaches several mechanics within the context of an assassination mission. An examination of player enjoyment and learning yielded surprising and important results. On one hand, the expected results of the thesis revolved around the idea that players prefer Implicit tutorials over Explicit tutorials. Tester reaction indicates that both tutorials have their place and can be effective teaching tools. The difference between the two tutorial forms goes deeper than player preference and completion time. Specifically, unexpected player behavior suggests that Implicit tutorials have a profound impact on player creativity and experimentation. In addition, Explicit tutorials seem to teach the player the required mechanics with a higher success rate than Implicit tutorials. These results aid game developers in deciding how they structure the tutorials in their games, as the right application of a tutorial type could create a profoundly different game experience. The thesis hypothesis turned out to be largely inaccurate. The expectation focused on players completing the Implicit tutorial version as fast as the Explicit group while having more fun playing the Implicit. Testers rated both the Explicit and Implicit tutorial versions of the level an average of 5.1 out of 7 possible points. Testers did seem to slightly prefer the less controlling Implicit tutorial while learning basic mechanics while they preferred learning from the Explicit tutorial while figuring out more abstract concepts, such as stealth. In fact, results suggest that players may have more fun learning abstract gameplay from Explicit techniques, since it delivers critical information that would otherwise take the player some time to discover on their own. However, the difference in average score did not seem drastic in any section and suggests more of a slight change in tutorial effectiveness per level area over clear player preference for one type of tutorial. The second component of the hypothesis also proved inaccurate. Players did not prefer one type of tutorial over the other. Two different methods focused on answering this question. 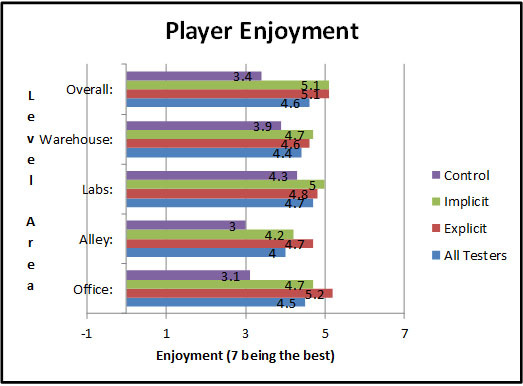 First, the testers described their level of enjoyment for each level area and the level overall. Comparing this information between each tutorial group (Explicit, Implicit, and Control) showed that people generally preferred versions of the level with tutorial instruction over no tutorial at all (5.1 versus 3.4 out of 7). However, the hypothesis stated incorrectly that people would prefer Implicit instruction over Explicit instruction. Overall, players enjoyed both versions of the tutorial the exact same (5.1/7). The data seems to suggest that players prefer Explicit instruction when learning more abstract gameplay concepts such as stealth and do not have a tutorial preference when learning simple concepts such as movement and healing. However, no significant difference emerged when analyzing the data using T-tests. A larger testing pool could identify statistically significant preferences. Players rated the Explicit version of the abstract sections .5 higher than the Implicit version (4.7 Explicit compared to 4.2 Implicit for the Alley and 5.2 Explicit compared to 4.7 Implicit for the Office). However, the difference remains slight, especially for the small testing pool of 31 players. The emergent gameplay data proved to be even more profound. 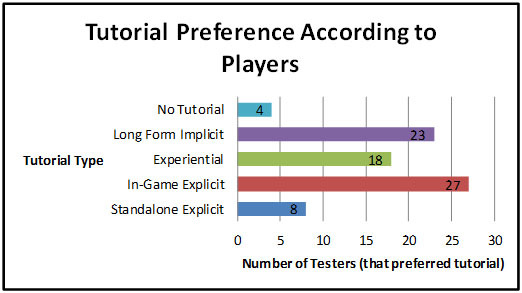 60% more players experimented to find unknown solutions to the level challenges within the Implicit tutorial than the Explicit or Control tutorials. Such stark contrast suggests an actual change in player behavior when provided just enough information to get the player going without giving away the entire solution. The test proctor observed that Implicit testers displayed a willingness to test alternate theories, even after the tester discovered the first successful solution. The Implicit testers could very well have taken longer to complete the level simply because they were taking the time to explore alternate solutions. By contrast, Explicit testers seemed predominately interested in completing the most recently explained mechanic as quickly as possible, while Control testers seemed anxious about the possibility of dying and losing their progress. Once Control testers died and restarted, they seemed interested in getting back to where they were as quickly as possible instead of taking the time to explore alternate options. A cause of the behavioral difference probably stems from the different intentions of each tutorial type. After all, Implicit tutorials encourage players to teach themselves. Explicit tutorials teach the player how to play as fast as possible. Those inherently different goals could create a natural difference in how quickly players complete the tutorial, depending on their tutorial type. Results suggest that developers could use Implicit tutorials as a tool to enhance player creativity when desired. 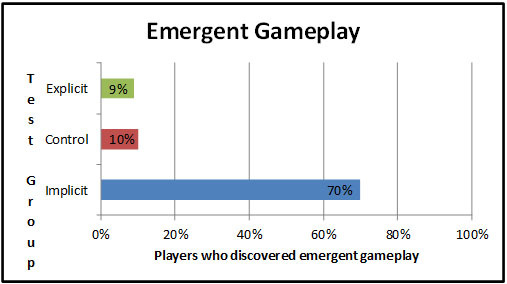 Emergent gameplay became a surprise critical factor in the data. Thoroughly testing and refining the level would have reduced unintended shortcuts. 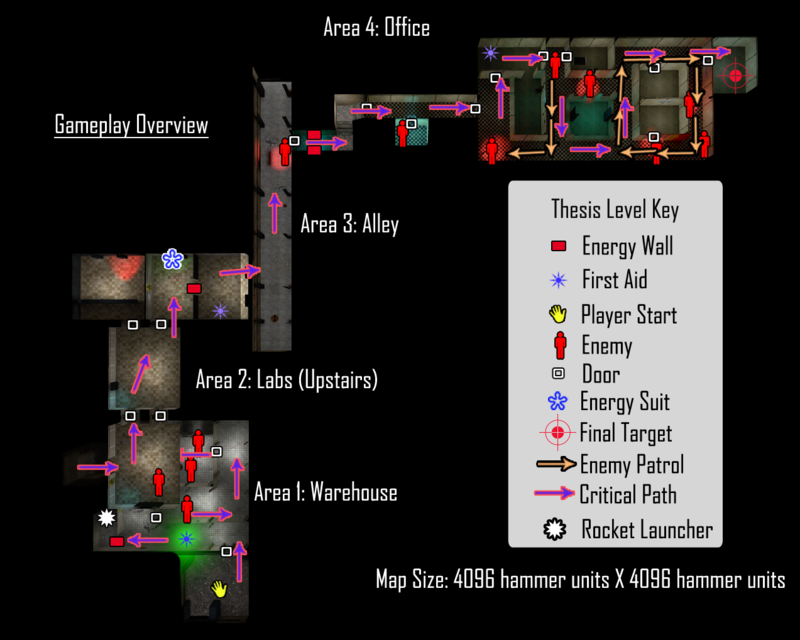 An analysis of the level construction and subsequent gameplay suggests that the unrefined nature of the level enabled players to express their creativity by accidentally leaving multiple avenues open for testers to complete each challenge.